I was always at a loss when my whole class began losing focus. Do I try to reset the room by switching to some type of independent practice? Would the opportunity to work in groups help regain focus? Long story short, those ideas didn’t work. Behavior is communication. 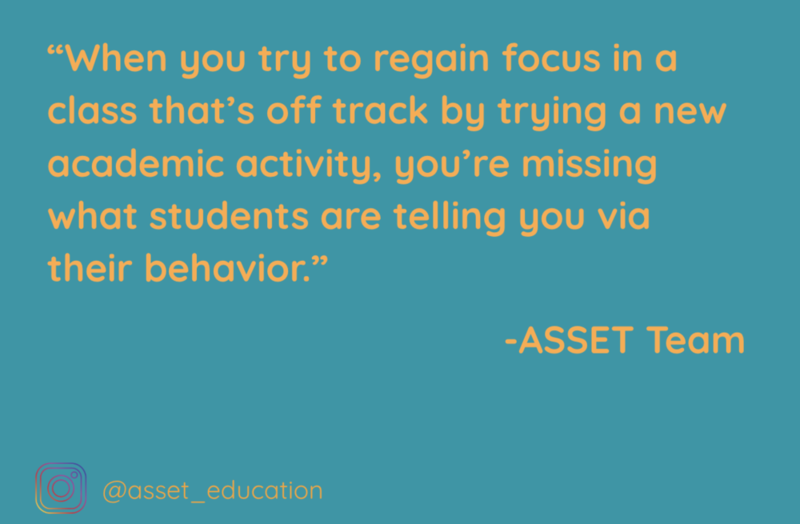 When you try to regain focus in a class that’s off track by trying a new academic activity, you’re missing what students are telling you via their behavior. They need to hit pause, reset, then restart. Next time your whole class is off track, try leading a brief mindfulness exercise to help your students find their place of calm. Even better? Give them a choice; ask them which ASSET tool they want to practice in that moment. When you offer and facilitate these tools outside of normal ASSET time, you improve the likelihood that students will practice these tools on their own.